Activated on 1 October 1941, the division was assigned to Fort Knox, Kentucky, for training under the Armored Force. In March 1942, under the command of Major General Jack W. Heard, it was transferred to Camp Cooke, California, from August to October 1942, and the unit took part in maneuvers in the Desert Training Center Area. Brigadier General Sereno E. Brett took command in 1942 and in February 1943, Major General Lunsford E. Oliver, who trained, lead and fought with the division during the remaining years of the war, assumed command. 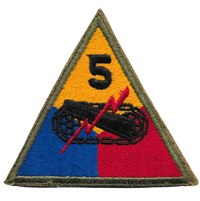 In March 1943, from April to June 1943, the 5th Armored Division maneuvered in Tennessee under the Second Army. In July 1943, it was transferred to Pine Camp (Now Fort Drum), New York, to prepare for overseas service and in February 1944, sailed to the European Theater of Operations. The division trained at Camps Chiseldon, Ogbourne, St. George and Tidworth-Pernham Down in Wiltshire, England. The division landed at Utah Beach on 24 July 1944, and moved into combat on 2 August, in the thick of the Normandy Campaign driving south through Coutances, Avranches, Vitré and St. Lo, and across to seize the city of Le Mans on 8 August. Turning north, the division surrounded the Germans in Normandy by advancing, through Le Mêle-sur-Sarthe liberated on 11 August, to the edge of the city of Argentan on 12 August, 8 days before the Argentan-Falaise Gap was closed. As part of General Patton’s Third Army, the division embarked on a 300 mile exploitation behind the German Seventh Army and the 5th pursued the enemy, wrecking their armor and inflicting high casualties all the way to the Seine River. Turning Argentan over to the 90th Infantry Division, the 5th Armored advanced 80 miles to capture the Eure River Line at Dreux on 16 August. Bitter fighting was encountered in clearing the Eure-Seine corridor, the second big trap in France. In the Eure-Seine Campaign, following the plunge of the Seine, the 5th Armored Division distinguished itself, receiving a commendation from the XV Corps Commander. The 5th passed through Paris on 30 August and it was then shifted to the First Army to spearhead V Corps drive through the Compiègne Forest, across the Oise, Aisne, and Somme Rivers, and reached the Belgian border at Condé, 2 September. The division then turned east, advancing 100-130 miles in 8 hours, and crossed the Meuse at Charleville-Mézières, 4 September. Racing past Sedan, it liberated Luxembourg City on the 10th and deployed along the German border. The reconnaissance squadron of the division sent a patrol across the German border in the vicinity of Stalzenbourg on the afternoon of 11 September to be the first of the Allies to cross the enemy frontier. On 14 September, the 5th penetrated the Siegfried Line at Wallendorf, remaining until the 20th, to draw off enemy reserves from Aachen. In October, the 5th Armored held defensive positions in the Monschau-Hofen sector. The division entered the Hurtgen Forest area in late November and pushed the enemy back to the banks of the Roer River in very heavy fighting. Also, the Victory Division participated in the original crossing of the Moselle River. The men of the 5th rate the December battling in the Hurtgen Forest and on the approaches to the Ruhr River as the most bitter fighting they experienced. They lived in mud, rain and ice and were constantly exposed to tremendous artillery concentrations. This was the month of savage warfare that broke the German spirit, never again did the Nazis fight with the ferocity shown at Hurtgen. On 22 December, the 5th was withdrawn to Verviers and placed in 12th Army Group reserve by continuing to advance and crushing enemy armor in the XV Corps objectives. At Koblenz, the unit smashed and then mopped up all enemy resistance. Crossing the Roer on 25 February 1945 the 5th, now part of the U.S. Ninth Army, spearheaded the XIII Corps drive to the Rhine, crossing the Rhine at Wesel, 30 March. The Division reached the banks of the Elbe at Tangermunde, 12 April—45 miles from Berlin, the nearest U.S. unit to Berlin. On 16 April, the 5th moved to Klotze to wipe out the Von Clausewitz Panzer Division and again drove to the Elbe, this time in the vicinity of Dannenberg. The division mopped up in the Ninth Army sector until V-E-day. Assigned to Supreme Headquarters Allied Expeditionary Force (SHAEF) after V-E Day, the division sailed for Home on October 2, 1945, and was an inactivated on October 11, 1945, at Camp Kilmer, New Jersey. In addition to the division Commendation received from XV Corps at the conclusion of the Eure-Seine campaign, Troop A, 85th Reconnaissance Battalion (then 85th Reconnaissance Squadron, mechanized) was awarded a Presidential Unit Citation for outstanding performance of duty in action from 15-20 December 1944, and Companies B & C, 47th Armored Infantry Battalion, received the Presidential Unit Citation for outstanding performance of duty and action on 4-5 September 1944. There are 46 soldiers of the 5th Armored Division World War II still listed as missing in action.